​Golfers love rules and some guys can be real sticklers for them. By that, I mean they ​have arguments and carry a pocket rule book to prove they're right over the tiniest of innocent infringements. That's a minority of guys but generally we all like to play by the book as best we can. The official rule book is 100 pages long and a bit boring to sift through and know which are the most essential. So we've summarized the most important ones to ensure you don't commit any mortal sins on the course. You may even get invited back to play again! ​Note that we're covering the rules for strokeplay here. That means you count all your shots and must put the ball in the hole to complete the hole. 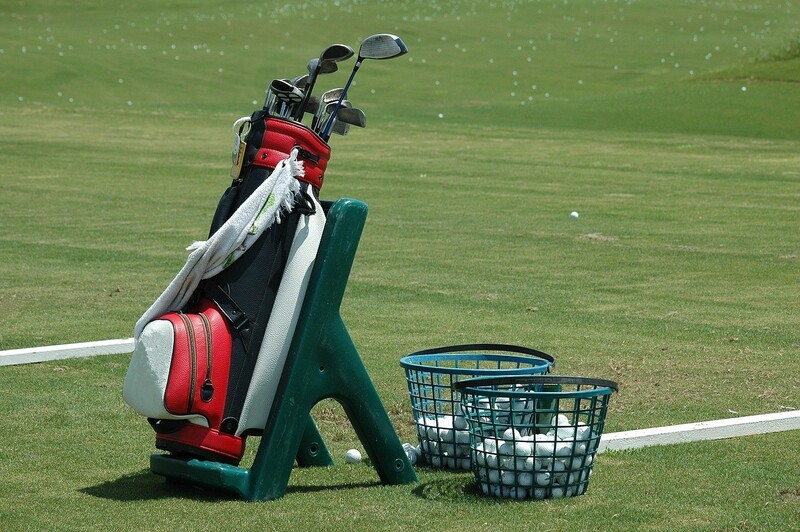 Clubs: You can carry a maximum of 14 clubs. If you have a 15th, leave it in the car to avoid complications. The 14 clubs can be a combination of anything you like. Ball: You must finish a hole with the ball you started it with. You can change a ball between holes but not during a hole. However, if you lose a ball during a hole, you can use any other ball as the new ball in play. You must tee the ball up behind the line created by the tee markers. You can tee it up anywhere between the two markers and you can tee it as far back a​s the length of two drivers. So if your driver is 45 inches, you can tee up to 90 inches behind the imaginary line. Never in front of the tee markers. If the ball falls off the tee before you swing at it, it doesn't count as a shot. Just put it back on the tee and roll your eyes at the lame joke someone will crack when they say 'one'. Hilarious. If you swing at the ball and miss it completely, that counts as one shot. If it falls off the tee from the wind you generate, you must play it from that position without putting it back on the tee - that was your first shot. Order of play on the tee is determined by the score from the previous hole. The lowest scorer hits first and in order of lowest to highest score until everyone has hit. The exception to this is if your friends play 'ready golf'. This is where whoever is ready, hits the ball regardless of their distance to the pin. You must play the ball as it lies. You're not allowed to kick it or move it to a better spot and neither is your long-toed caddie! ​You can't make the lie better so be sure not to press your club down very hard behind the ball to try flatten the ground. Also ​don't press behind the ball with your foot to make it easier to hit the ball! This rule is broken by a lot of people! No breaking or bending branches to allow you to swing easier at the ball. When you're in a bunker always remember to not ground the club in the sand behind or in front of the ball. Also no raking before your shot or using your fingers in the sand to test the consistency. The rules in 2019 now allow you to remove impediments like leaves and stones from the bunker. 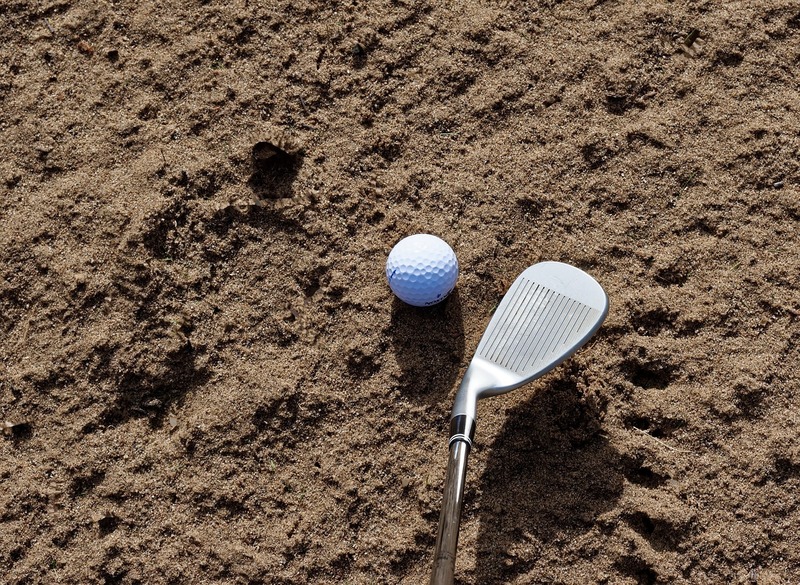 Also, if the club incidentally touches the sand, like while you're walking to your ball there is no penalty anymore. Just don't test the sand with your club! NO TOUCHING THE SAND ON PRACTICE SWINGS! ​In a water hazard (now known as penalty area - 2019), sometimes there is no water and you can play out of it. If your ball is inside the red or yellow lines of a hazard, remember the same rules in the bunker apply in the water hazard. No grounding the club, no touching the grass on the back swing, no fingers or hands to move anything like leaves or stones. You can't place anything in front of your ball for aiming or have someone stand in front of you to aim at them. You can however, use leaves and stones and grass that were already there to line your club up to for alignment! You can pick up sticks, stones, leaves, rocks, boulders, feathers, dead grass, pine needles that are around your ball but make sure not to move your ball because then that's a penalty. Use your hands to move the impediments because dragging your feet and kicking and changing the surface is not allowed. You can take a practice swing at fresh air but you can't actually hit a ball before your shot. You can hit an acorn on the ground or a stone if you like but no golf balls. The player furthest from the hole is supposed to play first. This is a good rule to follow initially in a new group of players. Someone will tell you that they play 'ready golf' which means whoever is ready can play without too much concern for order of play. If you do play 'ready golf', make sure you don't play while someone who is further from the hole is playing. You need to hit the ball with one strike. Scooping is not allowed. Pushing the ball with extended contact like a hockey puck is not allowed. Only hit a ball that is standing still. Don't hit moving balls unless it's in the water. It gets very complicated counting shots and penalties. Just don't do it! Identify your ball before you play it - if you hit any other ball but yours, you will get a 2 stroke penalty. An intentional double-hit is not going to be penalized from 2019 onwards but an intentional one will be. ​If any part of the ball is touching the green, it means you're on the green and can put a marker behind the ball and pick it up to clean. Well done! You can move away stones, sand, gravel, leaves and other loose impediments on your line. You can from January 2019 onward, fix the putting line whether that's a ball mark, spike mark, and pretty much prepare your line to be as perfect as you like. Without delaying play of course. Don't scrape or rub the surface of the green with your hand or club to feel grain or texture of the green. You can't test the surface that way. Sometimes golfers will ask you to move your marker left or right of where it is because it interferes with their line. Place the heel of the putter head next to the marker and move the marker to the toe of the putter. Remember to replace the marker to the original position before you play! Always ​replace the ball as close to the identical position it was in before you marked it. Another rule a lot of golfers break when they move the ball an inch or so closer to the hole! 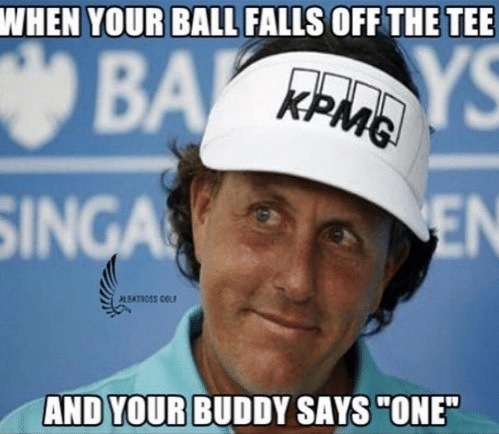 Get caught doing this, and you'll have no friends on the course! If your putt stops just on the edge of the hole, you can wait 10 seconds to see if it goes in. If it takes longer than 10 seconds to drop in, you count that drop into the hole as a shot. ​If your ball hits the pin when you're off the green, that's no problem as long as no one is touching the flag at the time. From January 2019, you can putt with the flag in and leave it in. There is no longer a penalty stroke for leaving the flag in while on the green. A real time saver! You can only ask your caddy for advice on how to play the hole. This means you can't ask another player which club he hit, or how you should putt the ball or which club you should use etc. For social rounds, this doesn't really apply and is probably the most broken rule in golf so gauge who you're playing with and listen to them speak to each other before engaging in breaking this rule. You CANNOT have your caddie line you up before the shot. They can give you advice where to hit the ball and advise you on the line of the putt but when it's time to hit, you have to aim and set up by yourself. You can't have the caddie stand behind you to tell you that you're lined up okay. Anyone can hold the flag for anyone else. You can also ask for information that is public knowledge like where the water hazards are and distances on the sprinklers your friend is standing next to. You can't give advice to anyone who is not your partner in a competition even if they ask; no matter how much you love them. If you play in betterball competitions, you ​and your partner can advise each other. If you move the ball while searching for it, there is no penalty. You have 3 minutes to find the ball, otherwise you have to drop or go back and rehit the shot with a penalty stroke added. If someone else or an animal moves your ball, there's no penalty. You must replace it then carry on as usual. If water or wind moves your ball, you play it from the new position! Don't put it back! NO PENALTY. When you drop a ball, stand up straight and drop the ball from KNEE HEIGHT. . The ball musn't touch your body or equipment in the act of dropping the ball. If your ball rolls into the hazard after a drop, make sure you retrieve it and drop it again. You must take full relief from obstacles or trouble so your stance mustn't be hindered by the thing you're dropping away from. If after 2 drops, the ball still rolls into the hazard or area you dropped from, place the ball on the spot it landed on when you dropped it last. Make sure you watch where the ball crosses the water hazard and drop at that point or behind that point in line with the flag as far back as you like. There's nothing that grinds golfers more than a guy who cheats with his drops! ​You may drop away from temporary water that breaks the surface of the ground and is not marked as a hazard. No penalty. You may drop ​away from areas marked GIR - Ground Under Repair. No penalty. You're allowed to drop ​away from burrowing animal holes. No penalty. ​If you land on the wrong putting green, you must drop it off the green 1 club length from the edge and play from there. No penalty. When you drop a ball, you must drop it from knee height. I have no idea why they made it so complicated and awkward - right now try dropping a ball from knee height. Don't you feel like a fool?. ​If another ball is in your way or interfering with your swing, you can ask the guy playing it to mark and lift it. 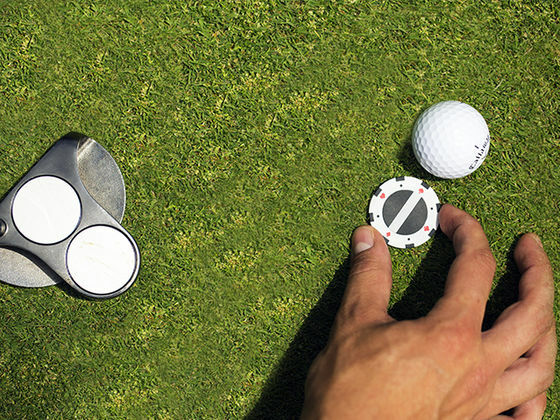 If someone asks you to mark and lift the ball not on a green, mark it with a coin or a tee peg and pick the ball up. You're not allowed to clean it so just hold it and replace when he's done. If you can't see if the ball you've found is yours, you can mark it and lift it to identify it then put it back in the original positon and play on. Man-made objects not part of the earth such as bottles, cans, rakes, stakes etc., are movable obstructions. Sprinkler heads, shelters, cart paths, etc., are immovable obstructions. 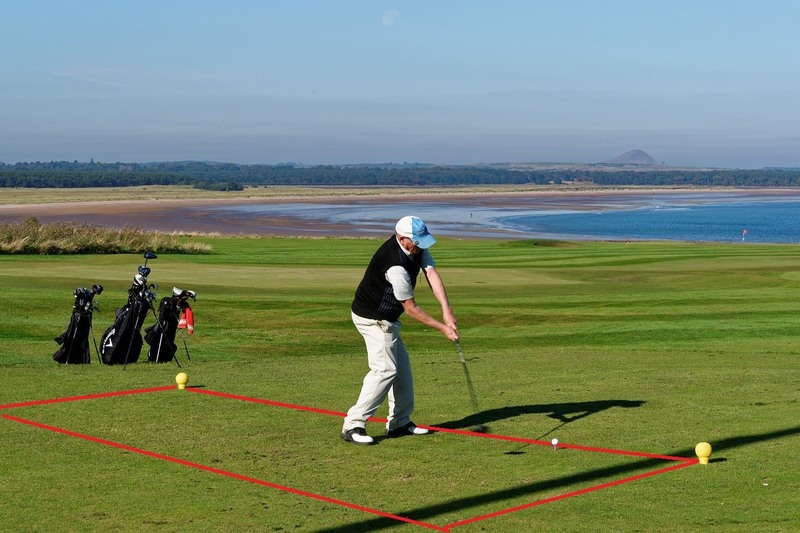 You can move the immovable obstructions but make sure your ball doesn't move! If an immovable obstruction is hindering your stand or swing, you can mark the ball, pick it up and drop it away so your swing is unimpeded at the nearest point of full relief. There is no penalty unless a rule of the specific golf courses forbids it. Water hazard (now known as penalty areas) are defined by yellow stakes or painted lines. Lateral water hazards are identified by red stakes or painted lines. 1. Drop a ball where you played the last shot and add one additional penalty shot. 2. Drop a ball in line with the hole and the place you crossed the hazard and go as far back as you like. 3. If it's a lateral (red staked) hazard you can drop within 2 club lengths of where your ball crossed the line of the hazard. In a water hazard, sometimes there is no water and you can play out of it. If your ball is inside the red or yellow lines of a hazard, remember the same rules in the bunker apply in the water hazard. No grounding the club behind the ball. ​If you hit a shot and think your ball might be lost in some bushes or similar problem area, or you suspect it could be out of bounds, you can hit a ball from the same position and call it "provisional". Then you can go look for the original ball and if you find it, you can play it and pick up the provisional ​with no penalty or you can deem the original unplayable and play the provisional ball with a one stroke penalty. You can also deem the ball lost at any stage and just play the provisional with a one stroke penalty. You must tell the people you're playing with 'this is a provisional ball'. Definition of lost ball: you can't find it in under 3 minutes or you declare the ball lost. You can also declare a ball lost while you're standing where you hit the bad shot from. Then the next ball you put down in the same spot is the ball in play and you add one penalty stroke. ​Definition of out of bounds: When the entire ball lies outside the white line or stake line signifying the out of bounds border. 1. Drop a ball on the line that runs from the hole to where your ball was lying. You can drop as far back as you want on that line. 2. Hit a shot from the same place you hit the last shot. 3. Measure 2 club lengths from where the ball is lying and drop it there. 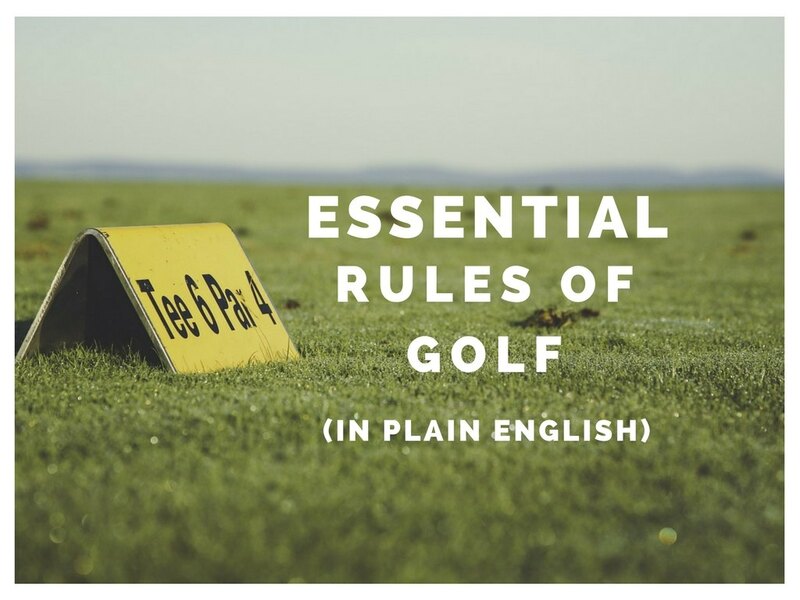 You can take a look at the full rules of golf here and here. How long is too long for a round of golf?